Halfbrick’s games usually grab me immediately. Jetpack Joyride (Free) was the cave flier of my dreams, Fruit Ninja ($1.99) devoured my high-score hunting hours. 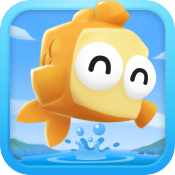 I didn’t immediately latch on to Fish Out of Water ($0.99), though. It doesn’t have the same obvious hooks—the shiny coins and the upgrades that keep you hitting that play button over and over. Heck, it doesn’t even have a typical high score system. That initial ambivalence gave way after I spent a bit more time with the game. What seemed painfully simple at first—skipping fish over the water as far as possible—began to show off some of its hidden depth. You can get by without paying any mind to the different qualities of the fish that star in Fish Out of Water, and you can ignore the weather as an oddity. It just wouldn’t be very much fun. 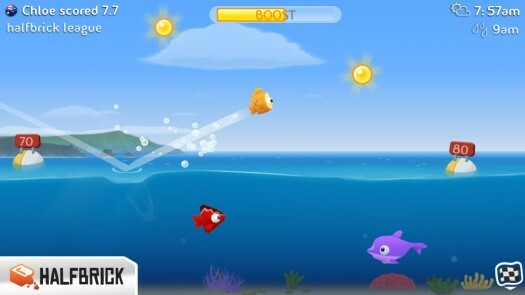 Without those things, Fish Out of Water is a quick, simple game. 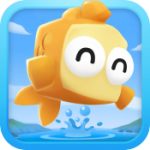 You pick a fish, fling it upwards and outwards, and watch as it skips across the water and eventually plunges beneath the surface. Once you do that three times a panel of crabs pops in, judges you on your performance on a rank out of 10, and takes off to let you start again. Sure, it’s entertaining to watch the fishies bounce and the crabs hold up their little numbered signs, but that’s sort of a hollow experience. 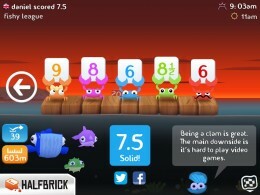 Good for a game for young children, but Halfbrick’s recent games have nailed that “fun for the whole family" thing. Get a little deeper into Fish Out of Water, and you’ll see it at work here too. There are two things you need to pay attention to: your fish, and the weather. You have six fish to work with, charmingly individual little fish with names like Micro and Finlay. Each of them has its own special properties. 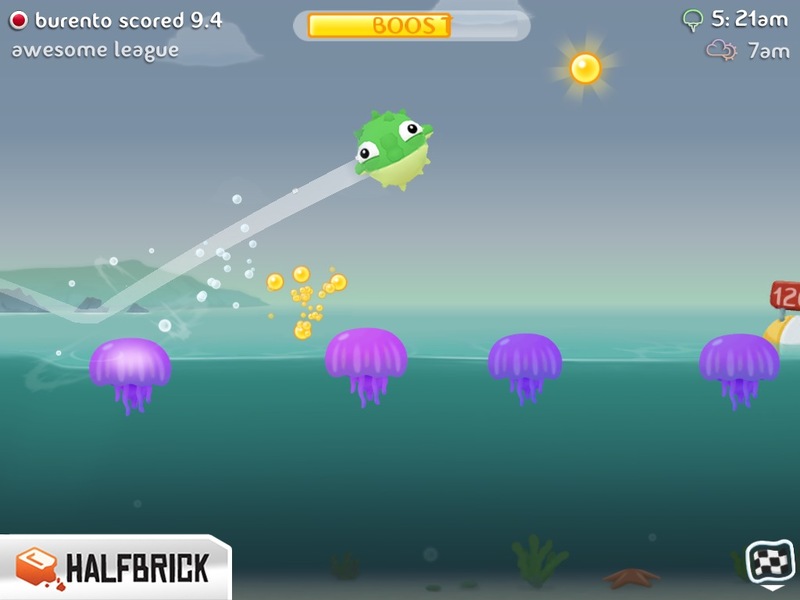 Some can skip across the water like crazy if you pitch them low, but will crash as soon as they hit the surface if you aim for a higher arc. Others do best with serious air. Some are fantastic skippers, and others have more endurance. Then there’s the weather. It changes every hour, which changes the conditions you’re playing under in turn. You might have to contend with big waves, snow, and other confounding elements. Tempting to just chuck it and play later when there are less than ideal conditions, but that’s the trick: every condition is ideal if you know how to approach it. 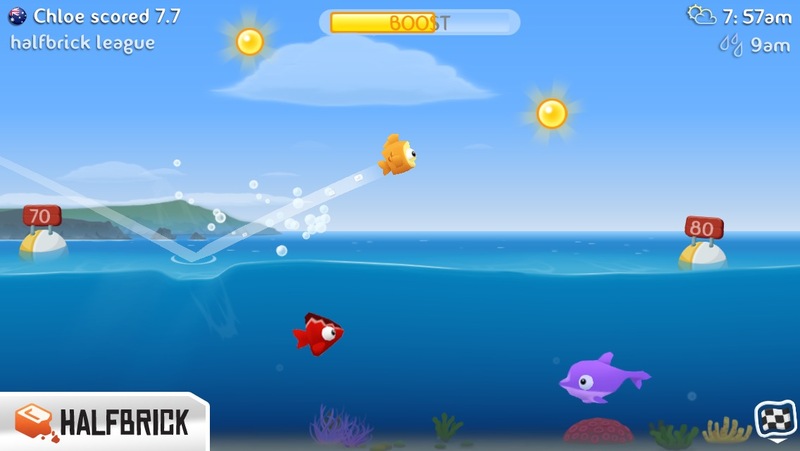 Getting familiar with how your fish handle calm seas is just the starting point. After that, you need to learn how they handle each type of weather you come across. Some of the fish are decent in calm, but shine in snow or storms. If you have a handle on that you’ll be able to score well no matter the weather of the hour. If you want to see how others are doing with the weather, you’ll need to join a league. That means signing in with Facebook, unfortunate in a game so appealing to kids, but you can avoid using your real name at least. Once you’re in a league you can rate your performance (and its performance) on a few different leaderboards, some of which point out the weather the leaders were up against. There is one other hook, aside from the competition: leveling. The game always gives you a mission, like “skip 50 times with Finlay" or “Fly through each of the rings" — rings that only show up when you’re on that mission, mind. Once you’ve completed three of those missions, you gain a new level. This unlocks a cute bit of art featuring the game’s adorable cast, and it gives you a handful of gems. Gems are the thing you might consider buying with real money in Fish Out of Water. You put them together to craft Charms, and Charms do all sorts of handy things like give you a few extra skips and a few more meters of travel, or force Harwood, the hard-to-please judge, to give you a ten. They aren’t gamebreaking advantages, but they offer a bit of a boost. All together, these systems make for a clever game. And it’s certainly a cute one. I’m just not convinced it will have all that much lasting power. Once you’ve learned all you can learn, scored as well as you can score, what’s left? There’s an upper level limit, and a small selection of fish. It might take a long time to earn that coveted 10 out of 10, but Fish Out of Water might also lose its charm on the way. 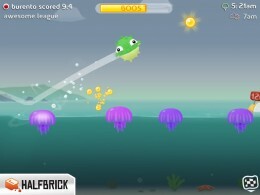 Launch a daredevil group of fishy friends to the sky in Fish Out Of Water, an adventure across the sun, sand and surf!